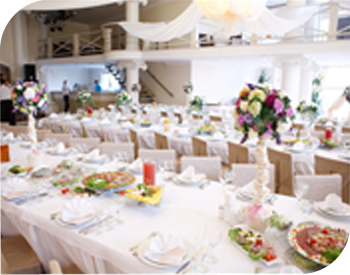 Summer weddings can have the same sophistication of weddings held any other time of the year. Though most couples prefer a lighter menu than would be served in the winter, the seasonal foods that are available can give your wedding added dimension and interest. If thoughts of a summer wedding make you think of elegant, carefully crafted food, consider these options when you design your menu with your wedding reception caterer. At the start of your event, focus on freshness. One of the best parts of the summer is having the opportunity to easily access organic, seasonal flavors that aren’t available at other times of the year. With farmer’s markets and local providers working to get their products out to market, your wedding food can have a depth of flavor. Think carefully about the way that you start your meal. Including items during your cocktail hour like goat cheese stuffed olives, pickled peppers and figs that are grown locally will provide a bite sized taste of summer for each of your guests. Offering handmade egg tartlets with prosciutto is another way to take advantage of what is available in the local markets. Don’t forget to speak to your Cleveland caterer about an artisanal cheese display. Listing the location where the cheese was made will give your guests an idea about what amazing foods are located right in their backyard. When you are considering the main course, simply prepared meats can be delicious and enjoyed by each and every guest. Offering grilled pork tenderloin or a sliced beef tenderloin combined with roasted vegetables, a selection of steamed new potatoes or a mushroom risotto is the perfect foil for these flavors. Accenting the meal with a mesclun salad filled with spring strawberries, sugared pecans and goat cheese is a light way to finish off the meal. Dessert can be the highlight of your meal. Light, elegant desserts such as chocolate mousse, tiramisu or a cassata cake are all elegant options for your guests. Small lemon meringue tartlets, Madeline cookies and fruit can make for a lovely presentation made by your Cleveland caterer. What is the best part about hosting a summer wedding? The variety of foods that are available. When you want to host an elegant summer wedding reception, there is no shortage of options that can be offered by your Akron caterer. From organic, artisanal cheeses to grilled meats and strawberry filled cassata cake, your wedding reception can be touching and delicious.